Win a chance to be Chef for a day! Originally from Keokuk, Iowa, Chef Dayton Carroll started his culinary journey preparing family recipes and gardening with his grandfather. He earned a Bachelor of Arts in Fine and Studio Arts/German from the University of Iowa and during school worked at Atlas World Grill, the Motley Cow and was involved with urban gardening at Friendly Farms. After college, Chef Carroll moved to Germany and worked for Restaurant Fehrenbach, Robert’s Bisto and food distributor Bos Food. He returned to the United States in 2012 and began working at Hy-Vee. 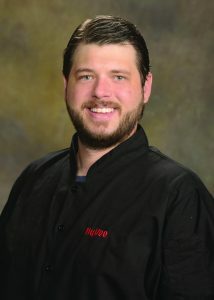 Chef Carroll was instrumental in opening the New Hope location and now serves as Executive Chef for the Hy-Vee Market Grille in Eagan.